That was an amazing share. I loved both your stories and how they so beautifully connected and tied into one another. Interwoven to make it even more profound than what initially felt it to be. Thank you so much. I even felt the loss of your dear Anasazi So touching The connection to the year of the rooster inspires more hope within. The Chinese New Year is being celebrated now, and it is once again the Year of the Rooster. I see this as a tremendously positive and powerful sign–a message of light and hope in this time of darkness. 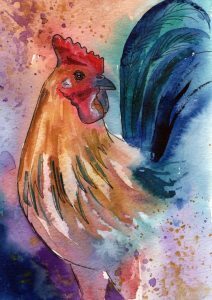 In honor of the rooster, I offer two stories that demonstrate how powerful and protective the rooster is–and how the rooster’s energy this year can lend us power and strength to drive back the darkness. So now, pull up a chair by the fire, and hear two stories of roosters and their magic. One is a story I’ve been wanting to tell for several years, and the other is a more recent tale.